(A) A 15.1 kb region used to construct the targeting vector was first subcloned from a positively identified C57BL/6 (RP23:210J2) BAC clone using a homologous recombination-based technique. The region was designed such that the long homology arm extended 5.30 kb 3′ to exon 10. The short homology arm is located on the 5′ side of exon 2 and is 2.96 kb long. 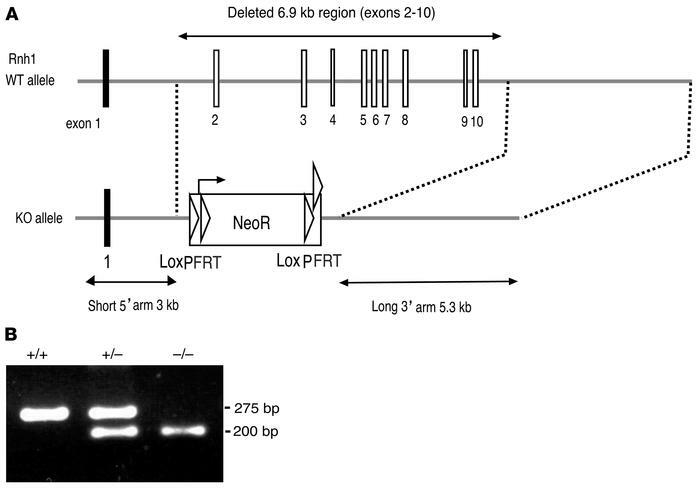 The Neo cassette replaces 6.89 kb of the gene, including exons 2–10. (B) DNA isolated from mouse embryos was genotyped by PCR. Primers were designed to distinguish WT and neo cassette gene sequence. 275 bp size corresponds to WT, and 200 bp size corresponds to knockout mice.